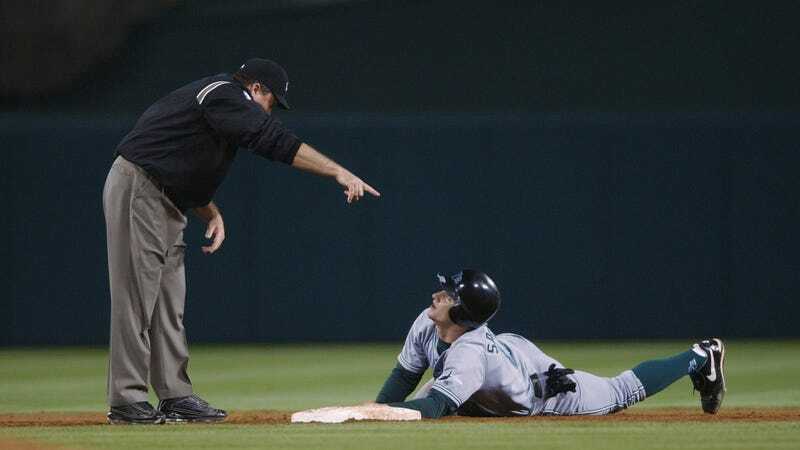 The biggest issue with mic-ing up umpire crews to explain replay decisions, which the Associated Press reports is potentially in the works, is that it’s simply not necessary. At a time when streamlining baseball games, especially the inactive parts, is seemingly of paramount concern to the commissioner’s office, why bother with changes that will only serve to further slow things down? According to the Associated Press, MLB and the umpires union are in talks to get microphones on crew chiefs as early as the All-Star Game. They tried for something similar at last season’s summer classic but failed to implement it in time. The NFL does this. Refs throw a flag and then explain to the crowd exactly which penalty they’re calling. But baseball has gotten along just fine without that step because the explanation is inherent in the ruling. If a guy is called out it’s because he failed to reach the bag before the ball. If such a call is overturned it’s because, on second look, actually he beat it out. In almost every case, the ruling is self-explanatory. Hearing it from the crew chief’s mouth won’t help fans who disagree feel better about the decision. The AP spoke to Marlins reliever Brad Ziegler, who cited the distinction between a call being confirmed by replay or simply allowed to stand due to lack of conclusive evidence to the contrary. This might be useful for players (can’t they just ask the umps?) and reporters filing game stories to know, but on the whole, it won’t impact the outcome of the game and won’t help convince traditionalist hold-outs that replay is infallible. Probably, this is just fine. It won’t take that much longer than simply signaling. It makes some sense for more complicated plays like the neighborhood rule at second base, or fan interference with potential home runs. (Although it doesn’t seem like the umpires will be enlisted to perform a tutorial on the rules themselves—at least not without quickly hitting the point of diminishing returns and delaying the game further.) It’s certainly not as bad as rule changes that alter actual game play. And I honestly can’t wait for the first ill-timed hot mic that catches CB Bucknor muttering the secret of why he’s still employed after all these years. This isn’t going to make umpires more accountable, and it isn’t going to make the game more entertaining. If you have no opinion on this whatsoever, that’s just fine. But if Rob Manfred is casting about for ways to improve baseball, he should probably keep looking.